Iran has consistently attempted to circumvent sanctions, resulting in numerous instances of international shipping companies transporting illegal weaponry to or from Iran for the purpose of building and sustaining its proxy and terror networks in the Middle East. This trend prompted Stuart Levey, then Under Secretary for Terrorism and Financial Intelligence at the U.S. Department of Treasury, to warn that, "US companies involved in third-country trade – as well as foreign shippers and freight forwarders doing business with the US – must be aware of their sanctions responsibilities. And all shippers, wherever they do business, should exercise enhanced vigilance, particularly where shipments may involve Iran." Since the JCPOA, Iran has sought to revive its previous shipping services and routes leading to dangerous and hostile interactions with international commercial ships. Foreign shippers, therefore, risk the safety and well-being of crew members when transiting in international waters near Iran. U.S. Navy operators consider approximately 10 percent of interactions with IRGC Navy forces to be unsafe, abnormal, or unprofessional. Furthermore, Iran continues to smuggle illicit weapons to Yemen and Somalia in violation of U.N. Security Council resolutions. The IRGC and its front companies operate many Iranian ports and are deeply involved in the commercial shipping sector. Therefore, foreign shipping companies could unwittingly become entangled in these illicit shipments as the layers of ownership are endlessly complex. These entities have successfully masked their involvement in the industry, leading international shippers to risk paying loading, docking and other port fees to an internationally sanctioned terrorist group. Below, see a list of high-profile incidents of Iran exploiting the shipping industry to transport weaponry worldwide. In order to halt these illegal shipments, international shippers must cease their Iran business. The USS Sirocco Navy ship boarded a dhow, the Adris, which was transiting international waters in the vicinity of the Gulf of Oman. 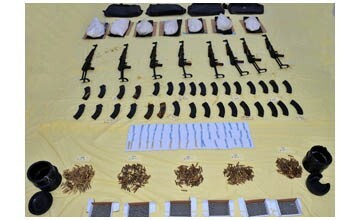 This resulted in the discovery of a large weapons cache aboard the vessel. The United States concluded that the arms had originated in Iran and the ship was likely bound for Yemen. The arms seized were found to be identical to those previously seized by France, which the United Nations had concluded were of Iranian origin. Sailors from the French Navy ship FS Provence intercepted a dhow off the coast of Oman. French government sources state the dhow was destined for Somalia. After examination of the weapons and analysis of information provided, the Secretariat confirmed that the weapons seized were of Iranian origin and were shipped from Iran. In February 2016, Australia’s HMAS Darwin intercepted the Samerr, a small fishing vessel found to be carrying a total of 2,197 weapons, including 100 Iranian-manufactured RPG-7-pattern rocket launchers. Coordinates entered into the dhow’s GPS navigation system revealed that it was bound for the port of Caluula, Somalia. The U.S. Navy accessed that the arms originated in Iran, and U.S. military sources say the shipment was likely intended for Houthi rebels in Yemen. IRGC patrol vessels ordered the Maersk Tigris, a Marshall Islands-flagged cargo vessel, to stop as it was underway in the Strait of Hormuz on its way into the Persian Gulf. The patrol boats then fired warning shots across the container ship’s bridge and was boarded by members of the IRGC Navy. The ship was then escorted by Iranian patrol boats to the Iranian port of Bandar Abbas. Following the release of the ship, Iran said the ship was detained because of a legal dispute between the Danish company chartering it, Maersk, and a private Iranian firm. Saudi-led coalition forces announced the seizure of an Iranian fishing boat carrying weapons bound for Houthi militias in Yemen. The coalition said the boat contained 18 anti-armored Concourse shells, 54 anti-tank shells, shell battery kits, firing guidance systems, launchers, and binocular batteries. 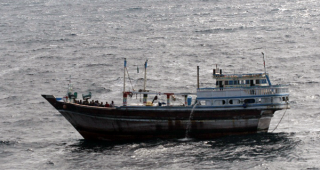 Fourteen Iranian sailors were also detained on the boat, which was seized off the coast of southern Oman. 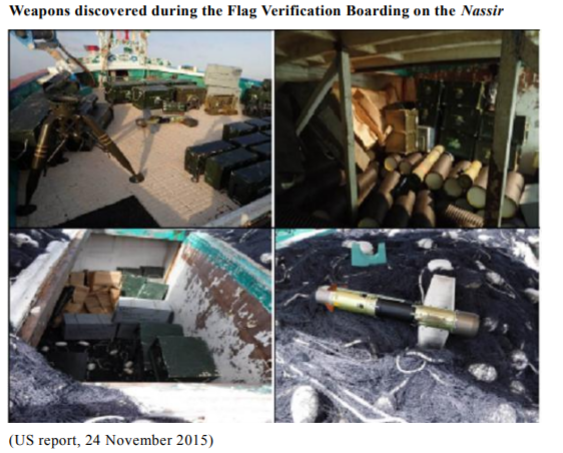 In September 2015, an Iranian registered dhow en route from Chabahar port in Iran was interdicted by the Australian naval vessel HMAS Melbourne while carrying cargo primarily composed of 75 anti-tank missiles bound for Somalia. The master of the FV Nasir was in contact with known arms dealers with links to a former pirate Isse Mohamoud Yusuf (“Yullux”), and the leader of the ISIL faction in Somalia, Abdulqadir Mumin. The Panamanian-flagged cargo vessel, Klos-C, was interdicted in the Red Sea by Israeli naval authorities. Cargo found aboard the vessel included 40 M-302 rockets, 181 120-mm mortars and approximately 400,000 rounds of ammunition. The cargo was concealed in shipping containers among bags of cement. 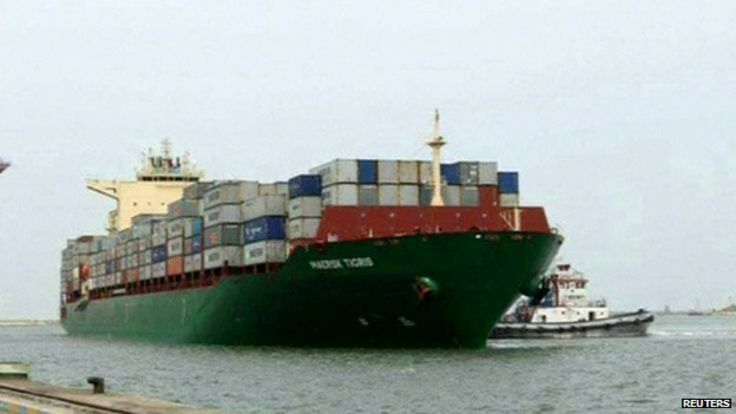 According to Israeli authorities, 100 containers, including those containing the armaments, were loaded on to the vessel in the Iranian port of Bandar Abbas. Bahrain’s Coast Guard and police jointly intercepted a vessel in Bahraini coastal waters, seizing assorted explosive materials, including what was described as Iranian-produced bombs. 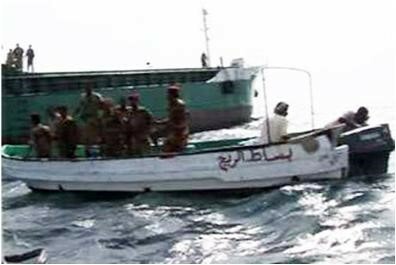 Yemeni authorities seized an Iranian dhow, the Jihan, off the coast of Yemen. The dhow was carrying a large cache of weapons, including surface-to-air missiles, being smuggled from Iran to insurgents in Yemen. In April 2012, the Atlantic Cruiser, a German-owned ship allegedly carrying Iranian military equipment bound for Syria was halted in the Mediterranean. “Defectors in the Syrian government apparatus” tipped off authorities about the weapons cargo. The ship had been chartered by a Ukranian company called White Whale Shipping and was bound for Tartus, Sryia. In March 2011, full of equipment they suspected could be used to make nuclear weapons smuggled on board a ship headed to Iran. The freight forwarder had falsely declared the contents as "goods used for liquid mixing or storage for pharmaceutical or chemical or food industry." The cargo was seized from a Malaysian-registered ship traveling from China to Tehran. The Malaysian International Shipping Corp. (MISC) was operating the vessel. In March 2011, Israeli forces intercepted the vessel Victoria in international waters in the Mediterranean, stating that it was carrying weapons by Iran via Syria. 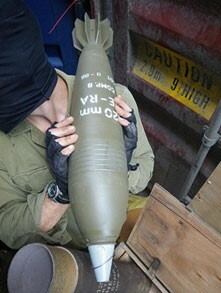 According to Israeli officials, the arms shipments included "." Israel says ultimate destination of the cargo was for the Hamas-controlled Gaza Strip. The vessel was chartered by French container shipper CMA CGM. In a statement, CMA CGM said, "The ship's manifests do not show any cargo in contravention [of] international regulations, and we do not have any more information at this stage." 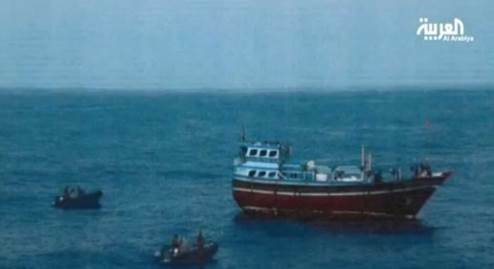 An Iranian fishing vessel was seized by Yemeni authorities seven kilometers from the coast of Hadramawt governorate after it pursued Yemeni fisherman in Yemeni territorial waters. An investigation by Yemeni authorities showed that the vessel carried a shipment of weapons comprising 900 Iranian-made anti-tank and anti-helicopter rockets intended for Houthi rebels. On October 26, 2010, Nigerian authorities seized 13 shipping containers carrying illegal Iranian weaponry at Lagos’ Apapa Port. The containers included 107 mm artillery rockets [Katyushas], explosives and rifle ammunition. The arms were to be shipped next to Gambia, with the final destination of the cargo possibly the Gaza Strip. The MV CMA CGM Everest originally picked up the containers from the Iranian port of Bandar Abbas. 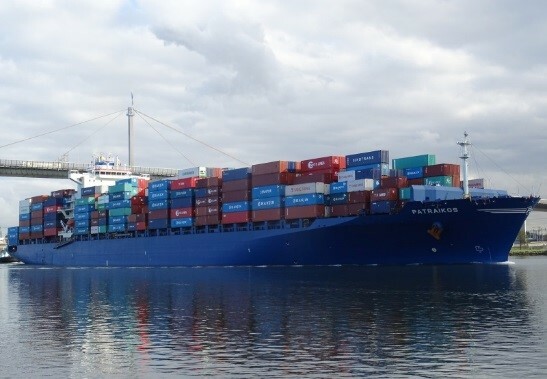 CMA CGM says it was victim of a false cargo declaration, claiming the weapons were shipped in packages labeled as "glass wool and pallets of stone" and that the Iranian shipper "does not appear on any forbidden persons listing." In November, Nigeria reported the seizure of the illegal arms shipment to the UN Security Council, accusing Iran of violating UN Resolution 1929. The resolution bans Iran from "supplying, selling or transferring directly or indirectly from its territory or by its nationals… any arms or related material." Two Nigeria-based members of the Qods Force, an elite unit of the IRGC, were implicated in the arms shipment. Aluminum powder from North Korea that could be used to make solid propellant for missiles was seized on a ship in Singapore harbor. The ship, the STX Patraikos, was en route to Bandar Abbas, Iran from Ningbo, China when it was stopped by Singaporean authorities. 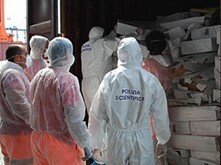 In September 2010, Italian police seized 7 tons of RDX explosives from an MSC-owned ship in the port of Gioia Tauro. Italian police believe the explosives, which were hidden behind sacks of powdered milk, were in indirect transport from Iran to Syria. On November 4, 2009, Israeli commandos boarded the MV Francop near the coast of Cyprus. 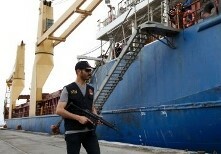 The ship was full of weapons from Iran destined for Hezbollah in Lebanon or Syria. The cargo included more than 300 tons of weaponry, including "thousands of medium-range 107- and 122-millimeter rockets, armor-piercing artillery, hand grenades and ammunition for Kalashnikov rifles.". The MV Francop is owned by the German company Francop Schiffahrts GmbH & Co and was operated by United Feeder Services, a Cypriot company. The ship is now operated by the Dutch company BG Freight Line BV. The Yemeni Navy seized in Yemeni territorial waters an Iranian vessel named Mahan 1. According to Yemeni authorities, among the crew were 5 Iranians. The First Instance Court of Sana’a convinced the crew of the Mahan 1 of smuggling arms from Iran to Yemen. 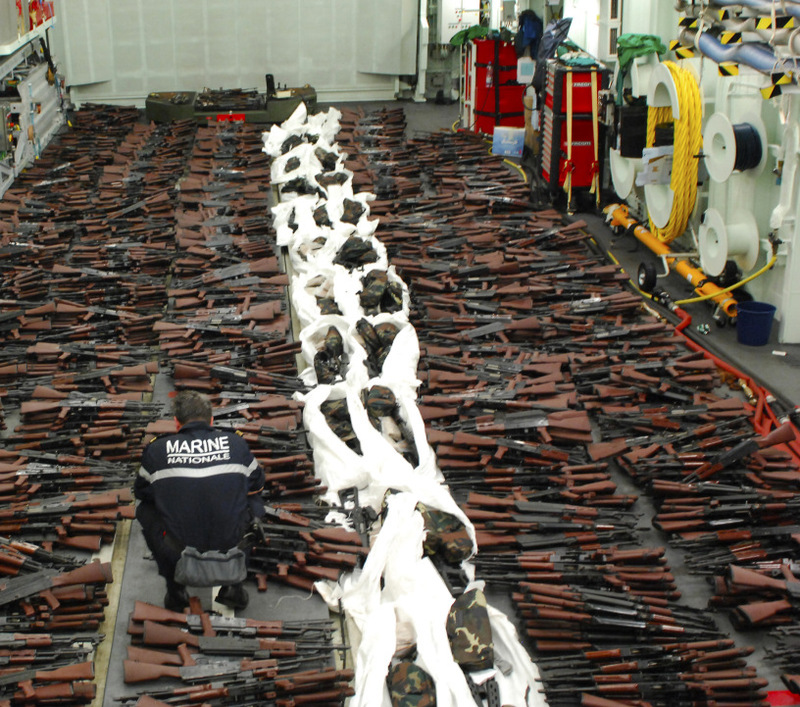 In October 2009 U.S. soldiers boarded the German Hansa India in the Suez Canal and seized a weapons cache. Seven containers contained 7.62mm ammunition and the eight enclosed cartridges suitable for the manufacture of additional rounds. "Investigators suspect that the arms were part of an Iranian shipment bound for either the Syrian army or for Hezbollah, the militant Islamist group. US officials have pointed out that the delivery is in violation of United Nations Security Council Resolution 1747, which prohibits arms shipments either into or out of Iran." The ship is owned by Leonhardt & Blumberg, a Hamburg-based shipping company. According to Leonhardt & Blumberg, the ship has been under charter for years to the state-owned shipping company Islamic Republic of Iran Shipping Lines. In July 2009, the UAE seized a shipment of weapons from North Korea destined for Iran. The shipment was made in violation of UN Security Council Resolution 1874 which bans all North Korean Arms exports. The weapons, which included RPGs, detonators, ammunition, and rocket propellant, were shipped by a Bahamian-flagged ANL-Australia vessel, which is a wholly-owned subsidiary of French container shipper CMA CGM. The weapons were exported by Italian company Otim, which had the cargo listed as oil drilling equipment. 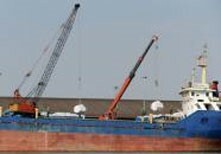 In January 2009, the U.S. stopped and boarded the MV Monchegorsk, a Russian-owned, Cypriot-flagged vessel chartered by the Islamic Republic of Iran Shipping Lines. The ship, bound for Syria, was found to be carrying weapons in violation of the UN Security Council’s ban on Iran exporting arms. The ship was detained in Cyprus, where local authorities confiscated and impounded 98 barrels of munitions that contained 3,300 cases of high explosives as well as shell casings and primers. On July 11, 2011, those stored Iranian munitions accidentally exploded (pictured) at a Cypriot naval base, killing 12 people in Cyprus’s worst peacetime military accident.